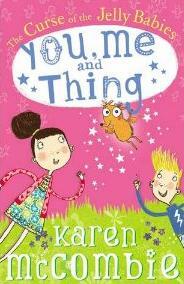 Last week we told you all about the funny new book called You, Me and Thing: The Curse of the Jelly Babies. Written for kids aged 7+ this is a really funny series that follows the friendship of Ruby, Jackson and … er… Thing! To find out more about the book – and also what exactly Thing is! – Luke was joined in The Club by the author Karen McCombie. Karen is also the bestselling author of other books like Ally’ s World and Stella Etc, which makes her perfect to find out tips for all you young writers out there and hear how she gets her ideas!